If you or a loved one is charged with Aggravated Robbery Deadly Weapon in Houston, Harris County, or surrounding areas call defense attorney Carl Haggard for a Free Confidential Consultation. Carl has over 30 years of verifiable winning experience fighting for the people of Houston. Call today and Carl will go to work fighting to win your case. Case No. 1538681 – Marquise G.
Marquise was accused of robbing someone at gunpoint. Our defenses included an alibi witness, conflicting statements on what the alleged gun looked like, documentation of several other robberies in the area around the same time by similar-looking suspects, and the “tainted ID” – the Complainant ID’d him based on eye color from a considerable distance as well as while he was already in handcuffs, a subtle but definite psychological influence. 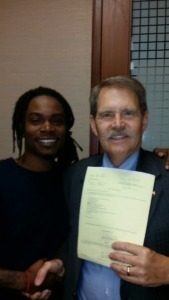 This case was dismissed on the morning of trial – Marquise was so happy he was dancing in the hall! Case No. 1569408 – Edwin V.
Edwin was on probation out of another state when charged with Aggravated Robbery and held in custody on high bail. He met up with Complainant at a storage facility at night to preview some items for possible purchase. When he declined to buy, Complainant went for his money. Edwin defended himself and Complainant, either intoxicated or on drugs, fell and injured himself, then lied that Edwin had held him up at gunpoint & robbed him. Using all available evidence and background information we worked up a compelling Grand Jury presentation to sufficiently prove no probable cause for the arrest, winning a No Bill and our client’s release from jail. Case Np. 1476816 – Patrick I.
Patrick found his neighbor, Complainant, trying to break into his apartment. Patrick beat him up and Complainant fled. When Patrick asked the leasing office to call police he was charged instead, based on Complainant’s lies that Patrick forced him into his own apartment at gunpoint, held him hostage, robbed him of $2500, then threatened to kill him if he went to police. We used several witnesses for our side. State claimed they had a disinterested eyewitness. Patrick was not about to plead to this so we prepared for trial. At Trial Motions we told the DA’s what to expect as our opening round on cross-ex of their “witness”. We got our Dismissal immediately although it came with a face-saving explanation by the DA’s office. Case No. 1380711 – Asia J.
Asia was charged as the get-away driver in Harris County. Our job was to prove by a preponderance of the evidence that she was set up, had no advance knowledge of the co-defendant’s plans to rob a mutual friend and did not cooperate in it once it was underway. Asia was driving two other friends around when the co-defendant called and asked her to go pick up another mutual friend and bring him to the bayou bike trail to talk. When they arrived the co-defendant pistol whipped and robbed the Complainant and threatened to kill him and dump his body in the bayou. We had to overcome statements made by Complainant that Asia did not drive away when Complainant asked her to, at the start of the assault, and that she then made him get out of the car after co-defendant had robbed him of his wallet and cell phone. Co-defendant demanded that Asia give the police a different story which she did – out of fear. Asia’s friends/witnesses testified that none of them knew of co-defendant’s plans or that he had a gun. We had not been able to obtain a Grand Jury No Bill and so had filed our Trial Motions to prepare for Trial. After a protracted and heated courtroom battle during the Pre-Trial Conference we prevailed in arguing the case to convince prosecutors of her lack of complicity. Case No. 1368640 – Yasin M.
At the time of this incident Yasin had psych issues and wasn’t on his meds. He was also on probation, had a prior Robbery charge, and a pending drug case in Galveston Co. Due to that drug arrest, his supply had been seized and his addiction forced him into going with a friend and others whom he did not know to make a buy. They set him up to drive the get away car, informing him they were going to make a buy. After “making the buy” [actually, an armed robbery / home invasion] they returned to the car and Yasin pulled away. Shortly after that things cascaded rapidly – an officer turned around on them, put his lights and sirens on, and one of the occupants put a gun in Yasin’s side and ordered him to step on it. He crashed the car and jumped out and ran, thinking in his confused state of mind he could escape from police. After jumping several fences and gaining entry into a citizen’s home he was eventually caught. Stolen jewels, cash and guns were found in the vehicle and in the area. Part of our defense included Tender Offers from our client and co-defendants that Yasin was not aware of or involved in the robbery. We obtained a tentative offer from prosecutors of Evading Arrest. Otherwise, Yasin would have been facing steep pen time – up to 99 years. Instead, after persevering and continuing to argue our defenses, we got the case entirely dismissed just short of setting it for Trial. Case No. 1316300 – Michael A.
Michael was a college student majoring in Criminal Justice when he got caught up in a Robbery and carjacking allegations surrounding a confessed marijuana buy. Police used evidence that Michael called Complainant on his cell and then went to meet him with his cousin and a third party. Michael bought marijuana from Complainant and returned home with his cousin only. Several weeks later he learned of a warrant for his arrest for Aggravated Robbery. Apparently, Complainant had been robbed at gunpoint and had his vehicle carjacked that night. To protect himself, Complainant lied to police regarding the reason for their meeting, stating that it was to make some recordings at a music studio. We had to undo this misinformation sufficient to establish Michael’s credibility. Complainant positively ID’d Michael as the one that entered his car – which Michael confessed to – and who robbed him while another person held a gun to his head. Our defense included the theory that the third party committed the robbery and carjacking during the time we could not account for his presence. Although we were never able to prove that, we didn’t need to. But we were able to prove beyond a reasonable doubt that Michael was not guilty of the crime. Without the help of his cousin’s testimony – (afraid to come forward) – we had to piece together for the Grand Jury the timeline of events and locations of all three parties at the scene sufficiently to absolve Michael of complicity, despite Complainant’s lies and his positive ID of Michael. Character witness testimony and Affidavits of cell phone records were also used for the Grand Jury. Case No. 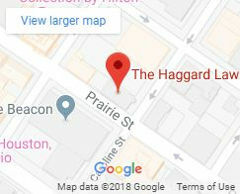 1086452 – Mike C.
Client’s father, a retired HPD police officer, hired Mr. Haggard when his son, while under the influence of three different illegal drugs, stole one of his service revolvers, broke into a storage facility and held up the occupants. I’m a retired HPD officer. A family member required the help of a true God-fearing criminal attorney. Mr. Haggard came very highly recommended. His knowledge was the key in getting a deferred Dismissal and a new chance in life with no criminal record. God Bless. Case No. 1293501 – Danny E.
This was a 2009 Aggravated Robbery allegation of holding up a family at gunpoint inside their home. Danny was in custody for a Felony Marijuana and a Felon Weapon charges [which we also got dismissed] when picked out of a live lineup after Complainant’s wallet was found in the room of a co-defendants in the POM case. Danny’s family gave us an alibi that he was at home continually at the time in a state of serious depression over the murder of his brother two months previous. Medical records with an Affidavit were filed in support of his many medical and mental issues. Another problem with the State’s case was the lack of latent prints at the scene. But the biggest problem with this case was the 2-year old memory of the Complainant who picked Danny out of a live lineup: 84% of wrongful convictions in Texas are due to faulty eyewitness identifications of the suspect. There are no set, written guidelines for how officers are to conduct eyewitness ID’s and therefore many errors are made. We had an expert witness/psychologist lined up to testify at trial regarding eyewitness memory issues of false memory and memory errors caused by stress but were able to sufficiently prove State’s evidence problems to obtain a Dismissal prior to Trial. Mr. Haggard worked extremely hard on my three serious cases which also involved some relatives who were also charged but we had to have separate lawyers. I have a record and I have seen many lawyers. He’s by far the best lawyer I have ever seen. Case No. 1236670 – Michelle N.
This was a classic “wrong place – wrong time” setup in which Michelle, a young single mother, was caught up. She was charged with participating with 3 co-defendants in the robbery of two men at gunpoint in a park: Michelle and a friend [co-defendant] had been dropped off at a club by two male acquaintances [co-defendants]. The men left the girls stranded so they accepted a ride home with two strangers. They ended up being dropped off at a park. It appears it was a pre-arranged plan between the two men/co-defendants who had “stranded“ them and the girl co-defendant – but Michelle was entirely in the dark about it. Once at the park the two men who had stranded them showed up and robbed the two strangers Michelle and co-defendant had accepted the ride from. In a confused melee, the 3 co-defendants called her over to them as one fired several shots and robbed the 2 men at gunpoint. Michelle, terrorized by fear, sided with those in power – the criminals with the gun. Also, she recognized them which to a traumatized person is a strong draw – whereas the men she’d arrived at the park with were strangers. The co-defendants yelled at her to join them which she did, zombie-like, running to their side as they executed the robbery, and then, still in a state of shock, followed their orders to jump into their getaway vehicle – not the victims’ truck she had entered the park in. The State’s best offer was 15 years TDC. Michelle declined this as her participation in the robbery was apparent only, and due more to shock and trauma. One of our first defensive moves was a Motion to Sever her trial from that of her 3 guilty co-defendants due to conflicting testimony and admissible criminal records on the part of co-defendants which would have prejudiced a jury against Michelle. In an unusual move, we then prepared our client to testify against her co-defendants at their now-severed trials while continuing to present strong exculpatory arguments and evidence, including meticulous crime scene reconstruction, all of which combined to the Michelle’s exoneration and the Dismissal of her case. Case No. 1178497 – Javier G.
Two Complainants they were robbed at gunpoint by two Hispanic males while two others remained in the car, presumably as lookouts. The Complainants misidentified Javier as holding a gun whereas it was the driver who had the gun, which was recovered after being thrown out the window after a police chase. Many stolen items and 17 lbs. of marijuana were found in the car. By a skillful use of the evidence, we were able to prove the Complainants’ ID of Javier was false. 84% of wrongful convictions in Texas are due to faulty eyewitness ID of the suspect. There are no set, written guidelines for officers in conducting eyewitness ID’s and many errors are made due to the stress of the victim. We argued that “mere presence at the scene of a crime is not enough to convict” and further threw weight on the side of lack of complicity by a timeline reconstruction which showed that Javier had joined the group just shortly before the incident. Also in our favor was our discovery that the driver had multiple Robbery counts against him alleging the use of a similar type of gun as in this case. The driver received 15 years in prison for multiple robberies. The 2 co-defendants pleaded guilty to another robbery case. And we obtained a Dismissal for Javier on the morning of Trial. I was looking at 99 years to life on a crime that I was sure I didn’t commit. I trusted Mr. Haggard with my life and he made sure he brought me back with my family. He fought hard from the beginning and was professional. Everybody in the court gave him respect. The first and best decision I made was to hire Mr. Haggard. Case No. 1179582 – Vialynshia W.
I work for the Louisiana prison system. I assumed my daughter would get life. I asked Mr. Haggard to save her. He’s the best attorney I’ve every worked with – our ‘personal miracle worker’. I’ve worked in the criminal justice system for over ten years. I was a witness in Vialynshia’s trial and was privileged to be a part of Mr. Haggard’s excellent defense strategy – one based upon his excellent preparation and knowledge of the law. Case No. 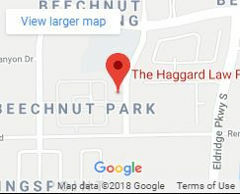 903310 – David D.
Our client was wrongfully accused of assaulting Complainant with a bat in a golf-course office and robbing the golf course of a large amount of cash. Two co-defendants pleaded guilty and one co-defendant and several witnesses testified against our client. By skillful cross-examination and use of the evidence, Mr. Haggard persuaded the Jury of our client’s innocence. Thanks to Mr. Haggard the jury found me not guilty – because I was not guilty. Mr. Haggard showed the jury by his great cross-examination and great preparation that the witnesses were not telling the truth. Thank you Mr. Haggard for giving me my life back. Case No. 1043476 – Juan G.
Our client had a prior record and pen time for narcotics and weapons. This alleged robbery of “stranger on stranger” was actually a drug deal gone bad. Mr. Haggard preserved and presented the evidence, phone records, tapes, witness testimony, among other things, and presented a compelling legal brief to the Grand Jury on the strength of which our client’s case was No-Billed. Case No. 784094 – Edward P.
Potential Verdict: 25 to 99 years or life. Case was tried for 2 days and, following a hearing on Mr. Haggard’s Motion to Quash the Identification made by the accuser of the client, was then dismissed. Mr. Haggard worked very hard on my case. I was falsely accused and the state dismissed the case in the middle of trial. I was facing 25 years to life in prison and I’m only 19 yrs. old. Case Nos. 1010622 and 1010623 – Paul D.
Our client had recently been released from TDC when he was accused of being involved with a robbery while driving in a vehicle with 4 others; all 5 were arrested. Mr. Haggard knew just how to exploit certain key weaknesses in the State’s cases and aggressively nailed home a dismissal of both charges on the morning of trial. Needless to say, client’s family was ecstatic, since he had remained in jail throughout the pendency of the case on a high bond: Not being able to afford to both bond him out and hire a good attorney, Paul’s family had chosen to spend their available resources on a successful trial attorney. Case No. 1005382 – David G.
Our client, a juvenile certified as an adult, was accused of having robbed a man at knife point, along with an adult co-defendant, five minutes before Complainant brought police to them to be arrested. Our client had no knife or cash on his person just five minutes after supposedly committing the crime. Mr. Haggard did a thorough investigation which revealed Complainant to be untruthful in several key areas and showed the lack of conclusive evidence needed to convict. Our client and Mr. Haggard refused to plead and the case was dismissed at Jury Trial. I’m not even 17 yet and I was looking at up to life in prison. My family and me put our hopes in Mr. Haggard and he didn’t let us down. Thanks, Mr. Haggard for coming to visit me in jail and for giving me hope. You never backed down and gave us the right advice all the way. Case No. 835799 – Ryan T.
The case was forced to trial because of the severe recommendation of punishment by the D.A. On Mr. Haggard’s advice, our client did not testify. Mr. Haggard persuaded the jury to grant our client less than the minimum. The verdict was later required to be corrected to show two years probation and no fine – which is the legal minimum. I was facing a lot of time in jail. He let me and my family make all the decisions on my case. I put my life in his hands. He spoke real well on my behalf to the jury and they were very understanding of the circumstances. He is a knowledgeable lawyer and he knows the law real well. The best decision I made was hiring Mr. Haggard. He really did care about my case and what happens to me. Case No. 801105 – Lakisha P.
Our client was charged along with her boyfriend (represented by other counsel) with a carjacking. Client was accused of assisting her boyfriend and disposing of evidence after the carjacking. Mr. Haggard did an excellent job on Lakisha’s case. He showed his expertise and professionalism on getting the case dismissed and will be first on my list for future retainment.